Every time I drive by Ward, I always see this colorful yellow and red restaurant peeking out. I read a couple newspaper articles about it when it first opened, and have been wanting to try it since! But as a foodie who wants to try everything, my list is long. 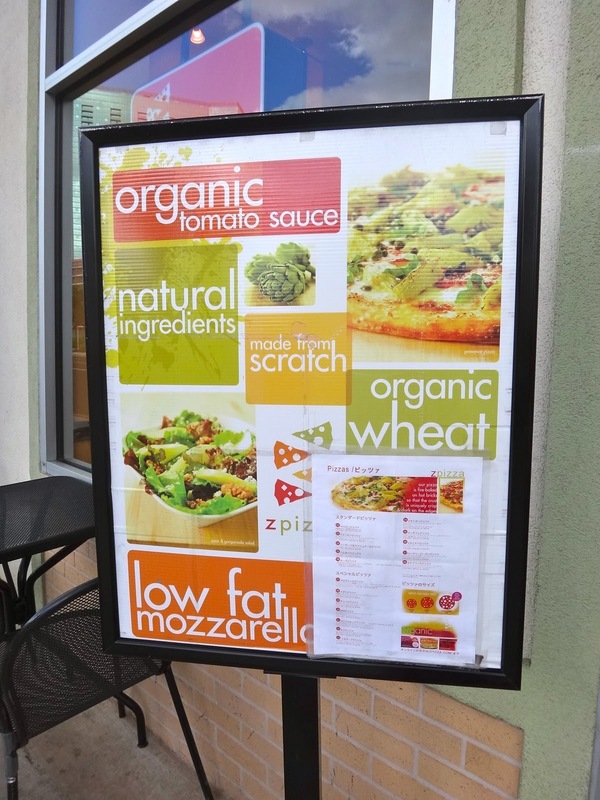 Born as a franchise, Z Pizza is known for serving pizza with ingredients that are only natural or certified organic. They are coined "The Pure One." Veggies are grown from local farmers, the mozzarella they serve is award-winning, and the meat they use are grass-fed Wisconsin cows. Also, their pizza crust is fire-baked for a crispier crust that "crunches with every bite." Allergic to gluten? 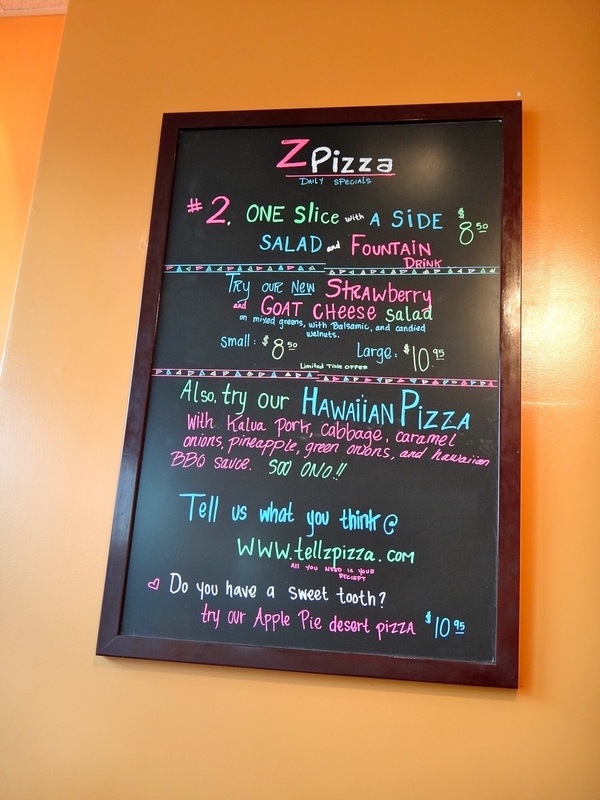 Choose from regular, wheat or gluten-free crust! 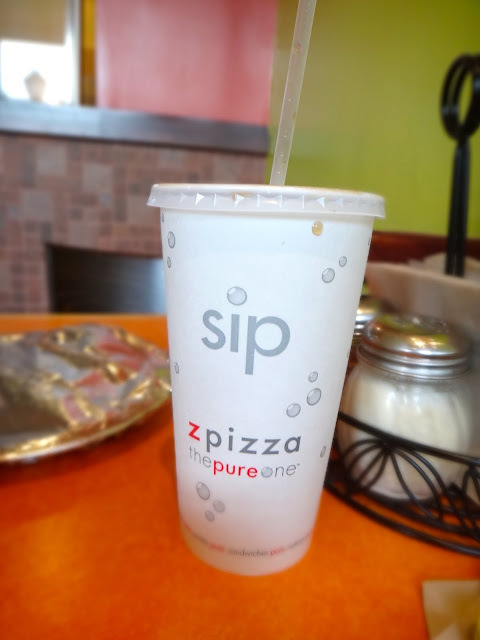 As you can see, Z Pizza boasts fresh, wholesome and hardy pizza; a much different twist on the usual Pizza Hut, Domino's or Papa John pizza that comes with extra garlic butter. Well, I finally got around to it yesterday! As a post-pilates workout snack, I decided to head down to Ward and try a "healthy" slice or two. Read some Yelp reviews about their daily special- 2 slices of pizza, a salad and a drink for $8.50 OR 2 slices of pizza and a fountain drink for $7.99. "What a great deal!" I thought, as I had seen the prices for a small, medium or large pizza and they were a little on the steep side. After looking at their menu online, all of their pizzas looked tasty, but the ones that caught my eye were the Casablanca (roasted garlic sauce, mozzarella, ricotta, mushrooms, artichoke hearts and parmesan), Provence (organic tomato sauce, roasted garlic sauce, mozzarella, artichoke hearts, capers, tomatoes, fresh basil), Napoli (roasted garlic sauce, mozzarella, tomatoes, parmesan, and basil), Tuscan (roasted garlic sauce, mozzarella, cremini, shiitake, and button mushrooms, caramelized onions, feta, truffle oil, and thyme), AND the Italian (basil pesto, mozzarella, ham, artichoke hearts, tomatoes and black olives). Of course, I didn't get to try all of them! The choice of slices you get are already predetermined. Whatever they make that day and have on hand is all you get to choose from. They won't make bake you your preferred slices as you order. So yesterday, the choices were Provence (pronounced PRO-VAHNS), Cheese, Pepperoni and from what I think, the Santa Fe. I asked about when they make the Casablanca- "only on Tuesdays and Saturdays usually." As for the Tuscan, they don't make certain pizzas by the slice, for example, the Berkeley Vegan, Thai, and Mexican. 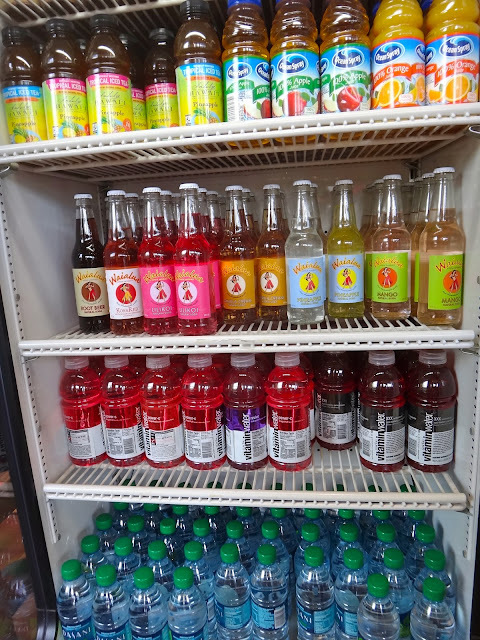 There are also the usual suspects- Cheese, Pepperoni, Ham and Pineapple, Sausage and Mushroom, or American choices, as well as, "Build Your Own Pizza!" Not in the mood for pizza? I've heard their Pear and Gorgonzola Salad is a favorite! My thoughts after taking a bite? I chose two slices of the Provence (pronounced PRO-VAHNS). Ate one there and took the second slice home for tomorrow's lunch! Although the pictures of their pizzas seemed topped with generous amounts of toppings, my two slices seemed a little bare. Taste was good, and I liked the light flavor of garlic sauce. My only gripe was MORE TOPPINGS! Other than that, I'm going back on Tues or Sat for the Casablanca! UPDATE! Ok, so I open up my foiled plate with my second slice of Z Pizza in it for lunch. To my surprise, a BIG slice plus A LOT of topping. So my only gripe now? More consistency with the toppings on each slice, please!! Take a look at this! Now THAT'S what a real slice of pizza should look like!